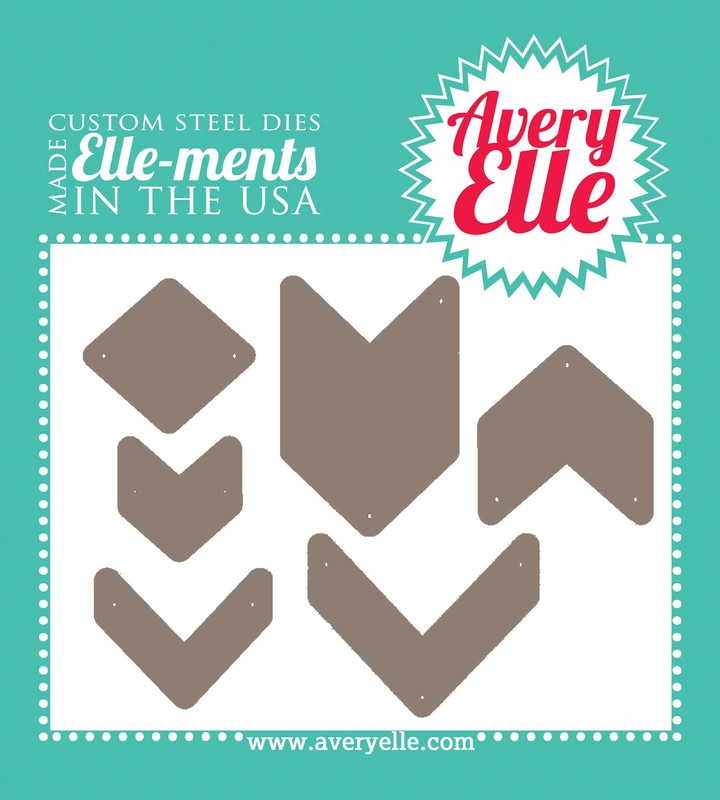 I'm so excited today to be giving you a sneak peek of two dies that I designed coming out for May at Avery Elle! 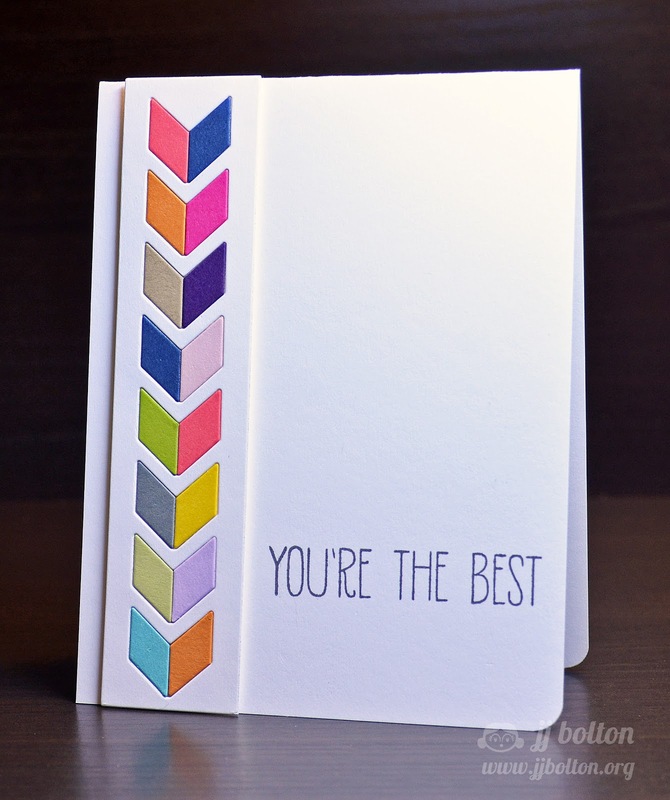 The card above uses the Chevron Border die (the sentiment is also from the new release)! As you can see this die perfectly fits an A2 card (the die measures 5-1/2" X 1-1/4"). 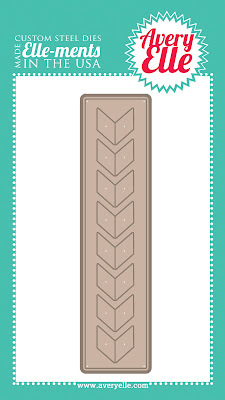 You can use it as a border die or use it to quickly cut diamond pieces that can be used to build all kinds of patterns! The design of the border die was inspired by this chevron card that I created almost a year ago. 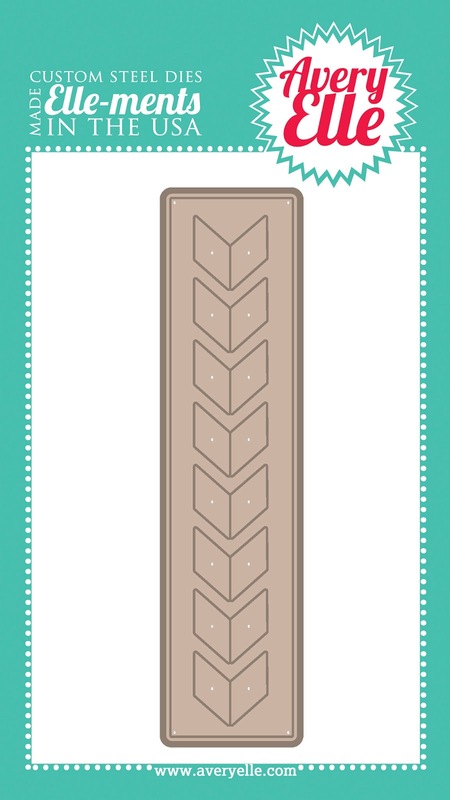 I designed the Chevron Border die to give you a similar look but a lot quicker and easier. The second set I designed is called Chevron Bits. This set has 6 dies in all. Some coordinate with the Chevron Border and some are totally new shapes. These dies are all separate pieces so you can use them for positive and negative die cuts. The card below uses the diamond shape from the Chevron Bits set with pieces from the Chevron Border to create a new totally custom look! I'm a big fan of getting the most out of your tools, and with these dies, there are endless possible combinations! 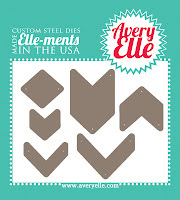 This is just the beginning of what can be done with these dies:) I hope the projects I've shared today whet your appetite for the Avery Elle May Blog Hop on May 2nd! The new release will be available on May 2nd in the store and Jamie is showing more sneak peeks of the rest of the release over at the Avery Elle blog now! There are lots of goodies this month, so go check them out! wowee, I love these! amazing, JJ! These are so fun!!! Great cards, JJ! Yes. Please. And Thank You. Awesome. For reals. I'm in LOVE already JJ!!!! Awesome work my friend.....that inspiration card was one of my all time favorites EVER!!! OMG, how cool are these dies. Love them. Maybe I can now attempt your inspiration card. May 2nd can't get here soon enough. Wow!!! This is amazing, JJ! So need those dies! Oooh!!! Love, love LOVE!!!! Can't wait to see more. Oh my goodness JJ, I have to have these dies and then I have to CASE your gorgeous cards. You know I always love what you do! I need these! I love your cards. This die is just awesome!! Totally loving its versatility, and what you can create with it! Fabulous showcase of the new dies! Awesome cards, JJ! 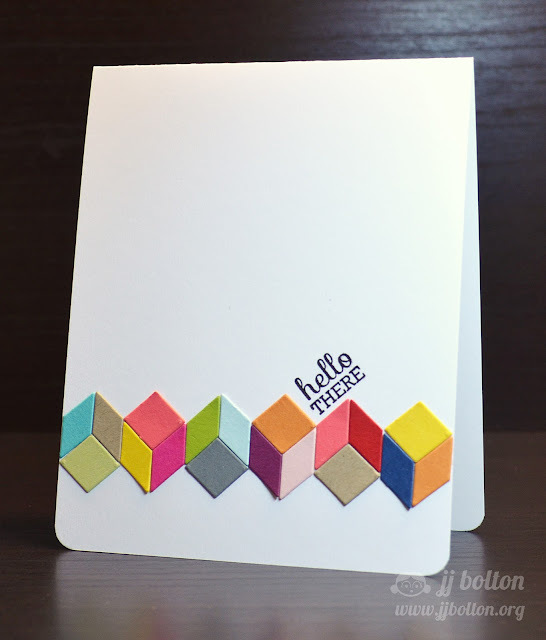 I love how your card inspired the creation of the border die...how fun is that! How delicious!!! Love the diecut and how you used them! They are outstanding! Oh wow! I love these cards and I can think of a million things to do with those dies. Can't wait to get them in my hot little hands! Oh em gee :) So clever, JJ! How awesome! I am so proud of you! SO happy to see your genius recognized and commemorated in these cool new sets! You know I'm all over this! 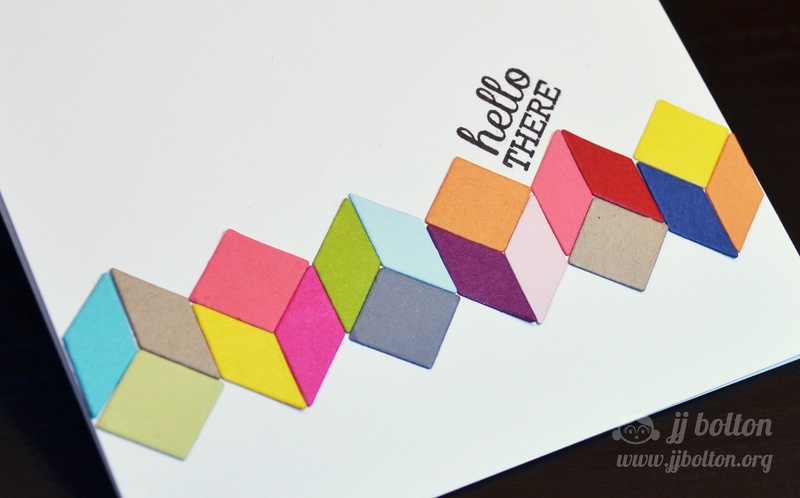 These dies are so perfect, so awesome... and so you!! I am bowled over by the design and the cards JJ - they are amazing!! Haven't been here for a bit and I've missed so much. LOVE the Hello There - a JJ original. Happy clapping for ya.